Orson Welles helped Edmund O'Brien get his start in show business. In no time, he became one of the screen's most popular heavies. From 1950 to 1952, he played the title role on Yours Truly, Johnny Dollar. In 1931, 16-year-old Edmond O'Brien, a big kid from New York City, was on the stage for the very first time in an amateur production in Westport, Connecticut. The director gave him what seemed like an easy job, all he had to do was help to carry Lady Godiva's bathtub across the stage. Maybe it was the excitement of a live audience watching him, maybe it was the excitement of a pretty girl with no clothes on, but Edmond staggered and wound up falling into the tub! Fortunately, the experience was not so traumatic that young O'Brien gave up acting. He began working in summer stock productions and eventually made it to Broadway. Sources cannot confirm whether his debut on the Great White Way was in “The Daughters of Atreus” of as the Gravedigger in John Gielgud's “Hamlet”, both opening in 1936, but it is obvious that after falling in the tub, Edmond was a young man who took his craft seriously. Like many other actors trying to make ends meet, Edmond began working in radio, where he met life-long friend Orson Welles, who used him in his modern dress production of “Julius Caesar”. O'Brien attracted the attention of an RKO scout and was given a supporting role in Charles Laughton's The Hunchback of Notre Dame (1939). RKO signed him to a multi-movie contract, and he began appearing in light propaganda films and B-grade films just before the U.S. joined the War. When his country called, O'Brien joined the Army in 1943 and was cast in Air Force's stage and screen productions of Winged Victory. O'Brien had a tough time getting back on his professional feet after mustering out of the Army. 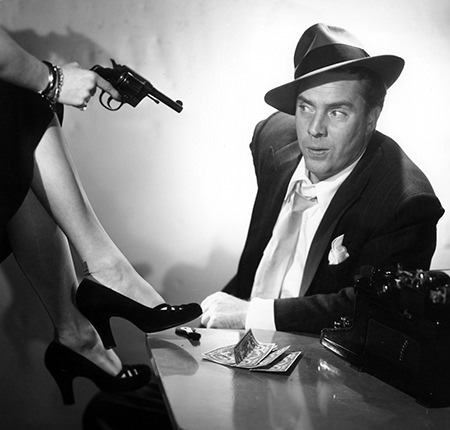 Eventually, he was cast in his first noir role for The Killers (1947). He married his second wife, Olga San Juan, the next year and they would have three children together. The O'Brien's built a reputation as Hollywood's most entertaining party hosts, installing a small stage in their Brentwood home. Party guests Mel Torme and Vic Damone would entertain, and O'Brien would join in Shakespearean recitations. 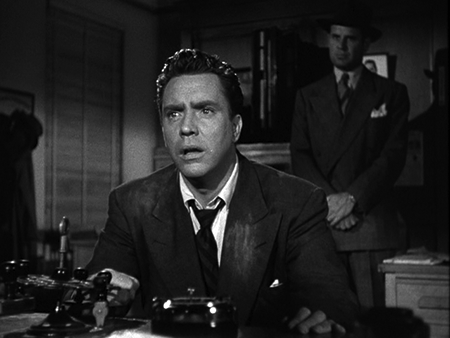 A number of noir roles filled the late 1940's for O'Brien, and in 1950 he played one of his best parts to date as the victim of poison who desperately investigates to find his own killer in D.O.A. That year he also took over the title role of Yours Truly, Johnny Dollar for the program's second season. With O'Brien in the lead, Johnny Dollar went from February 2, 1950, until September 1952, without taking a summer break. The break from movies was just what O'Brien's career needed, and in 1953 he began getting bigger and more important roles. He made six films that year, including Joseph Mankiewicz's Julius Caesar. He was not able to reprise the role of Marc Antony he had played for Orson Welles, but his Casca was memorable enough for Mankiewicz to put him in his next film, The Barefoot Contessa (1954) in support of Humphrey Bogart. 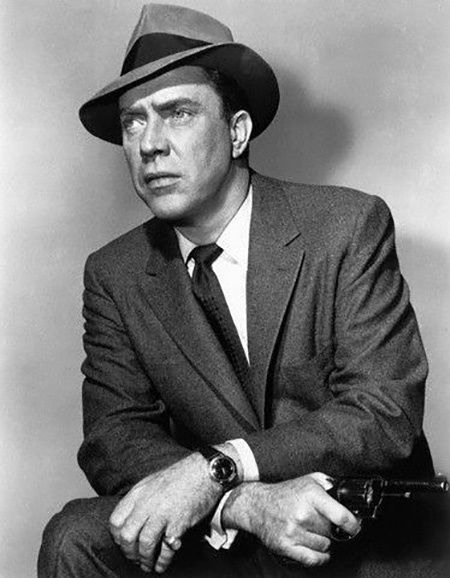 O'Brien would get the Best Supporting Actor Oscar for his portrayal of Bogart's harried press agent. That he should get the Oscar nod came as a surprise to the actor, he had expected that one of his friends who played in On The Waterfront, nominees Karl Malden, Lee J. Cobb or Rod Steiger would get the statuette. In 1955, O'Brien appeared as a gangster in Jack Webb's Pete Kelly's Blues, and the next year his career began to get traction from the Oscar win with 1984, A Cry in the Night, and The Girl Can't Help It. By now, age was catching up with O'Brien's waistline, and he knew that his days as a leading man were behind him. He also began having vision and memory problems, and needed an assistant to read him his lines and directions before shots. He still made some memorable films, including The Man Who Shot Liberty Valance, The Birdman of Alcatraz and The Longest Day, all released in 1962, Seven Days in May (1964), The Fantastic Voyage (1966) and The Wild Bunch (1969). Symptoms of Alzheimer's Disease finally made it impossible for O'Brien to continue working after the mid-1970s. He attempted to live on his own at his Brentwood home, but was eventually placed in a rest home. He passed away on May 9, 1985, at St. Erne's Sanatorium in Inglewood. Two Stars on the Hollywood Walk of Fame were dedicated on February 8, 1960, to honor Edmond O'Brien's contributions to Motion Pictures at 1725 Vine St and for Television at 6523 Hollywood Blvd. Be the first to comment on "Edmond OBrien"